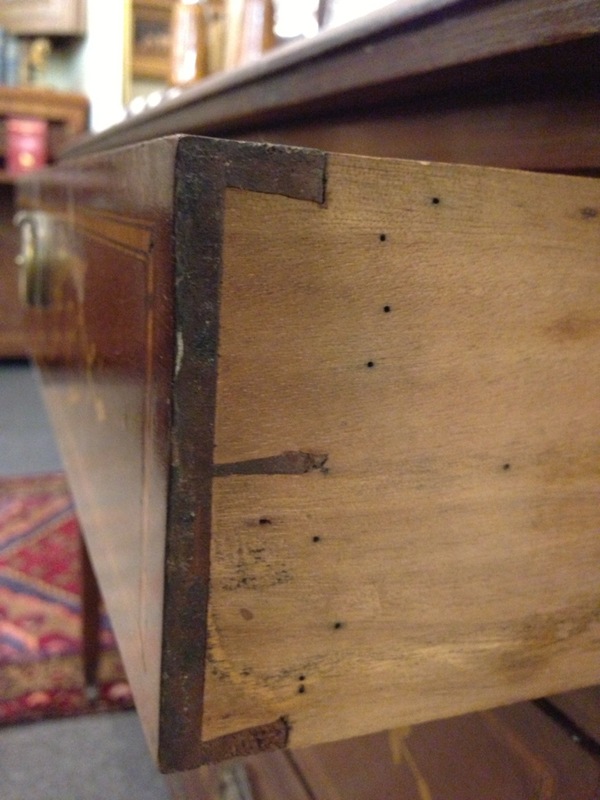 They Don’t Make Dovetails Like This Anymore. For A Reason. Take Two. 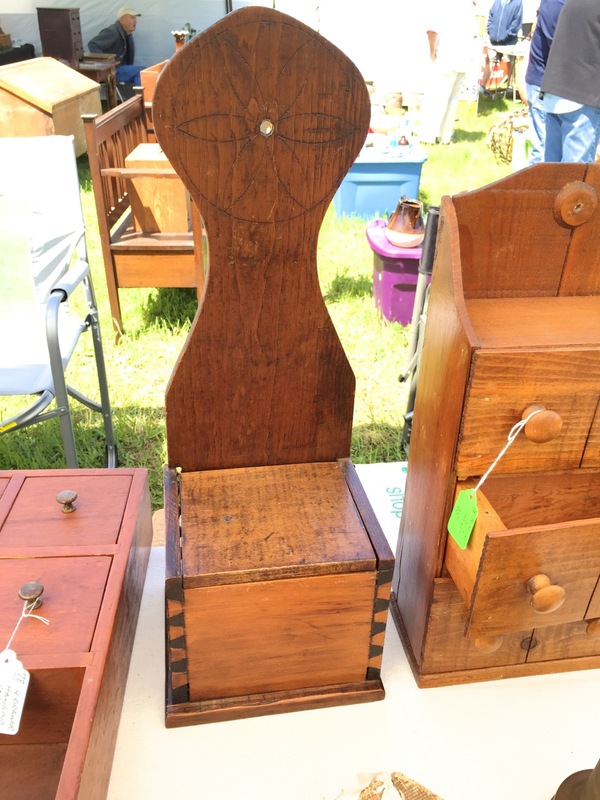 Last Friday and Saturday was held the annual spring antiques festival near Liberty, NC. For $7.00, you get access to over 400 dealers spread out over 100 acres. Or so they claim. I have no way to independently verify their assertions, so for the purposes of this post, I will just have to accept them. Every year I see things I haven’t seen before. Must be why I keep going back. This year was no exception. 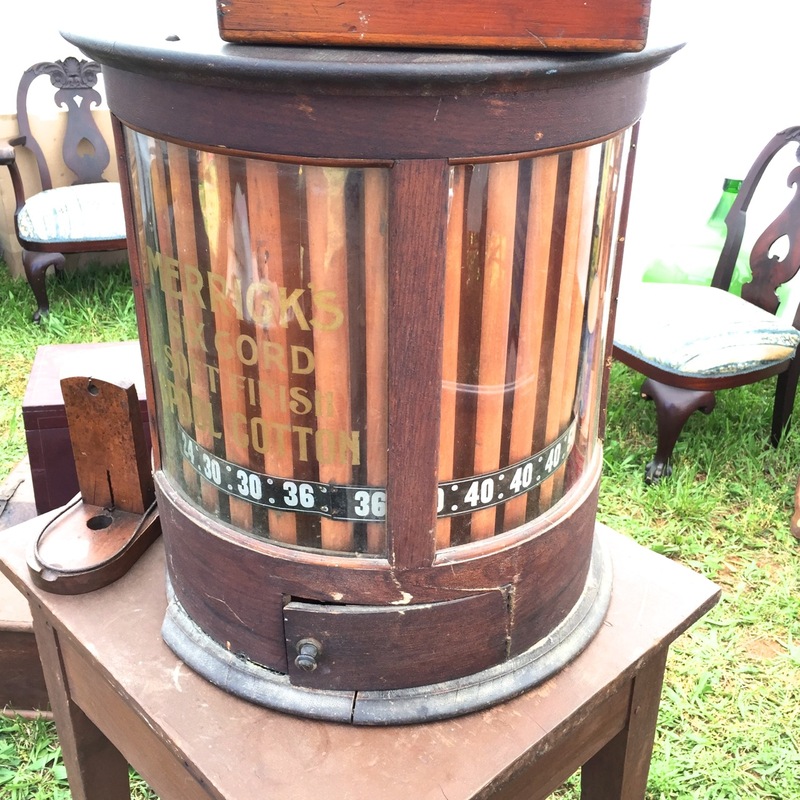 As much as I seek out (thread) spool cabinets, I had never seen a cylindrical spool cabinet before. Here I saw two. Not the way I would have done it. They might know more than I do. Never saw this type failure before. I saw the failure in the field but didn’t understand it until looked at the picture at home. 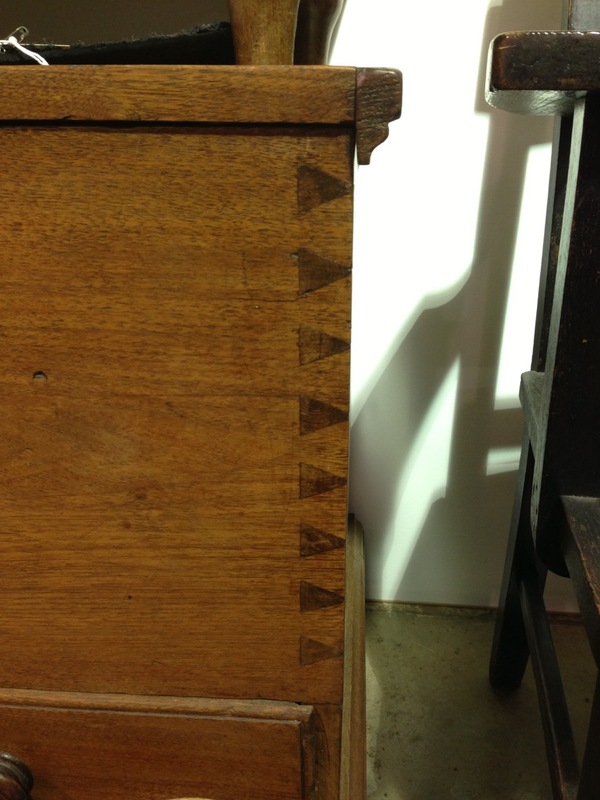 They dovetailed the back along the wrong axis. 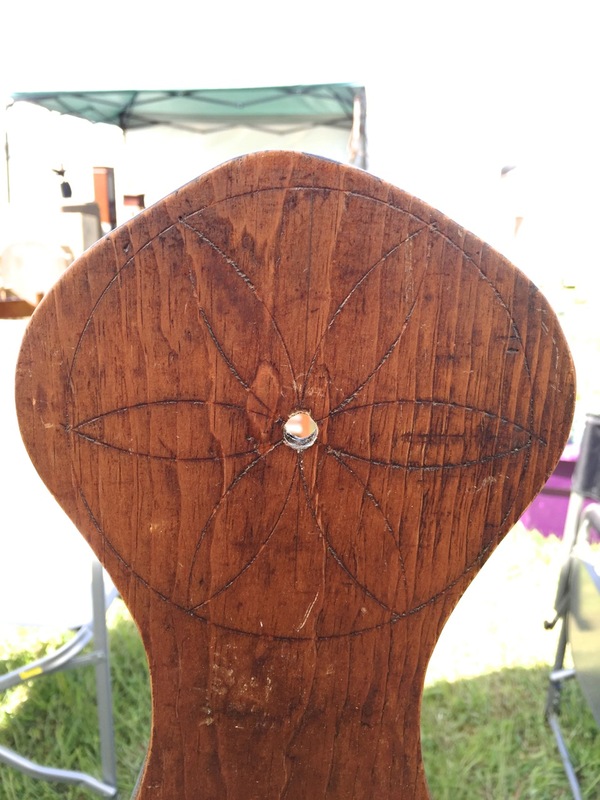 The wood has little strength along this axis. 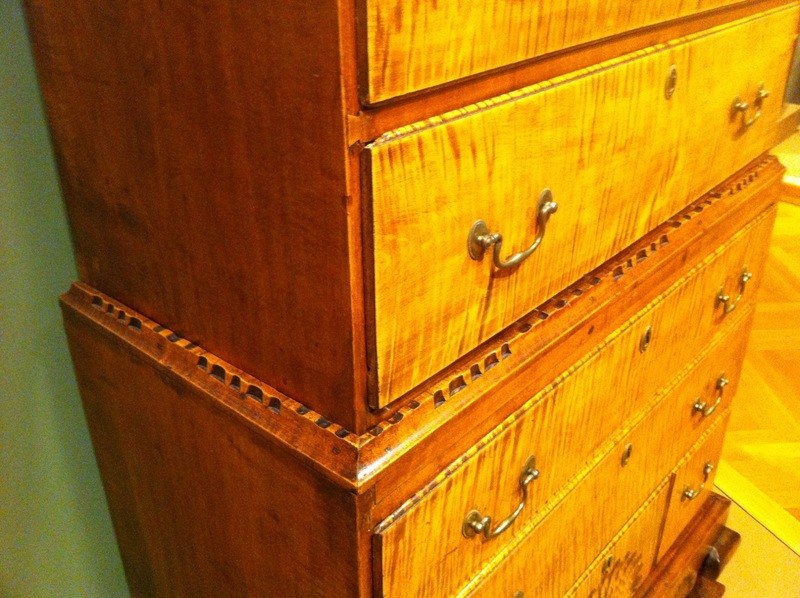 Wood tends to shear when stressed across the grain. 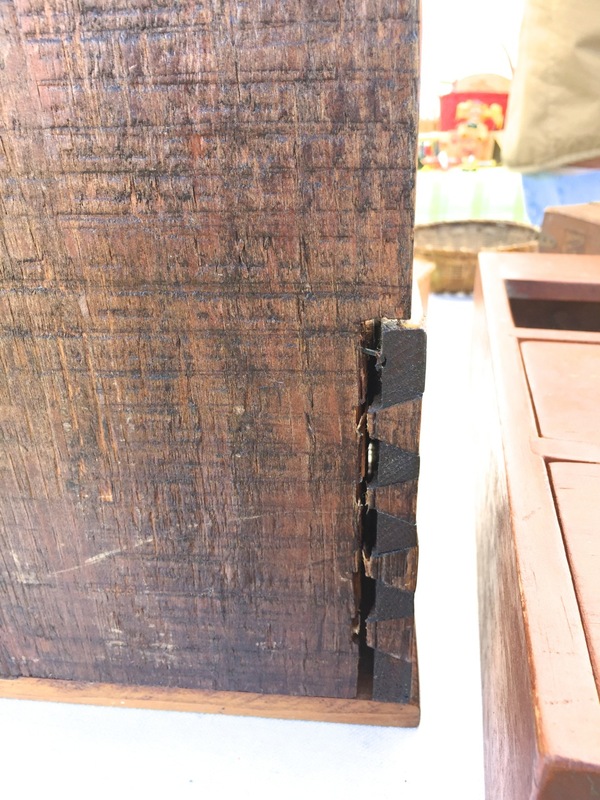 But if the maker had turned the wood 90° with the grain running from side to side, the dovetails would have held but the wood might have snapped off due to the height of the back and the lack of cross grain strength. 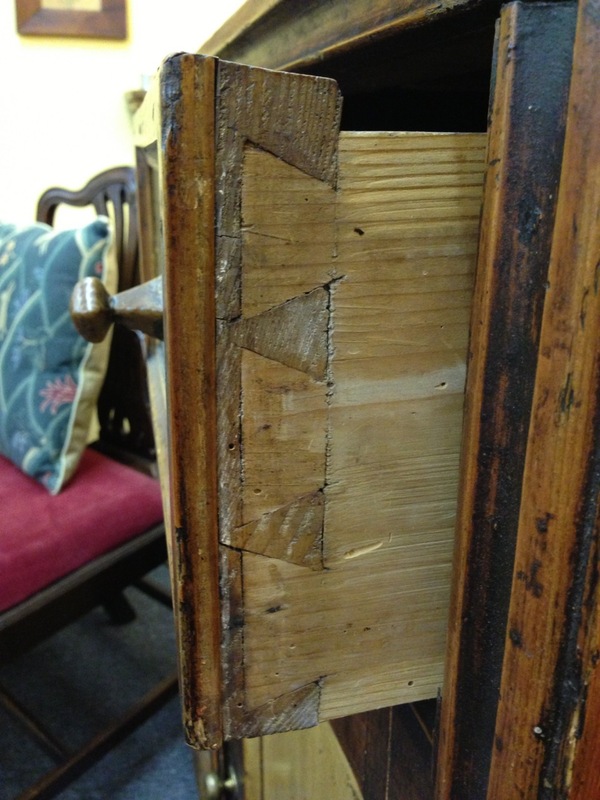 Could it be that the dovetail is not always the appropriate joint? 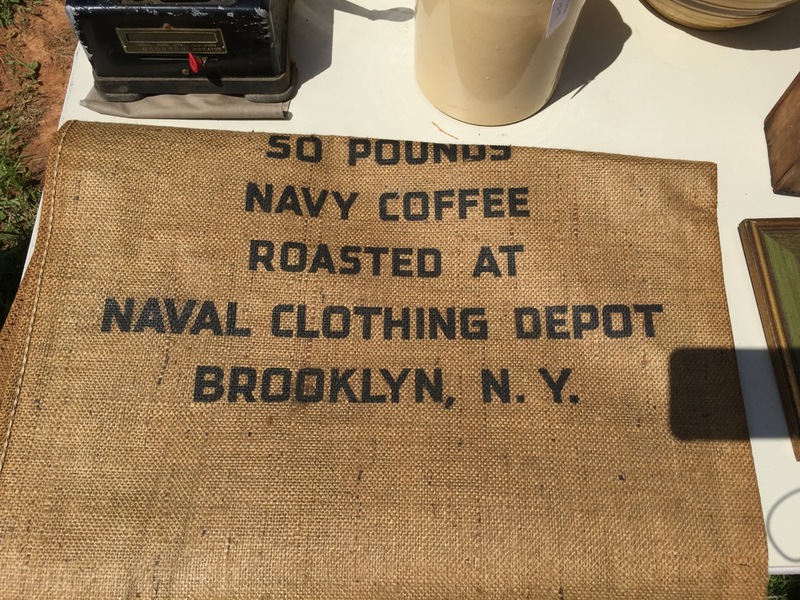 Did you know the US Navy roasted its own coffee? Seems they did. And they made their own clothes, too. Apologies for the first post. After midnight, the Preview and Publish button look very similar. 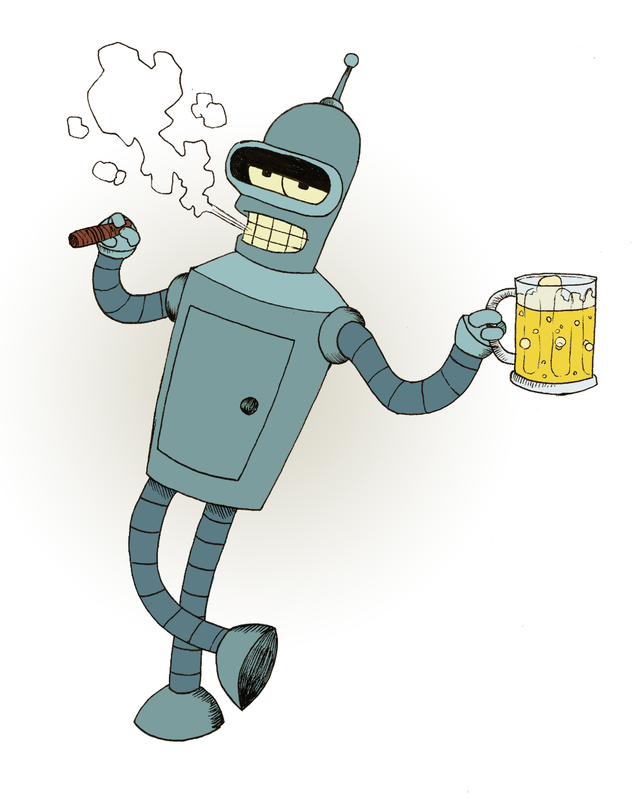 No, in this instance I am not referring to Bender Bending Rodriguez, irrepressible star of the hit TV series Futurama. 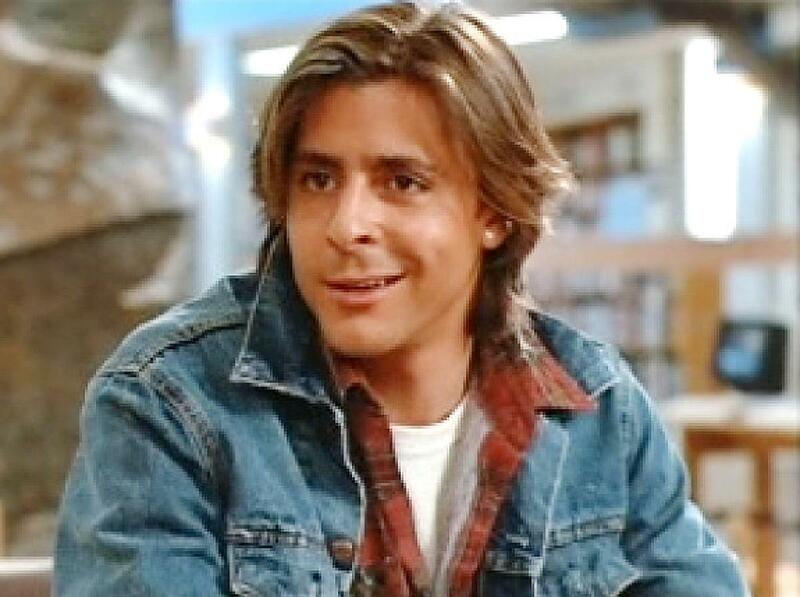 Or John Bender as played by Judd Nelson in The Breakfast Club, the 1985 John Hughes film. Not this Bender either. Though, similar hair. 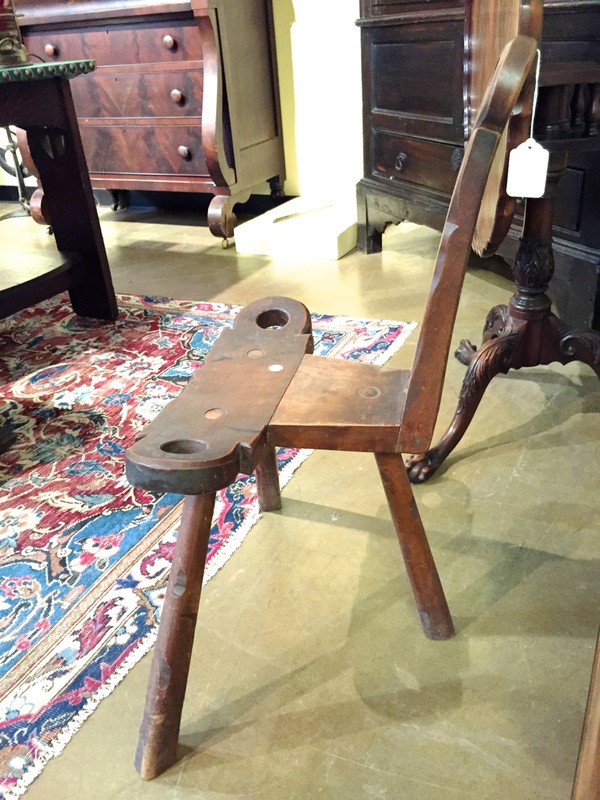 I am referring to Charles (Chuck) Bender, one of the leading period furniture makers in southwest Ohio. 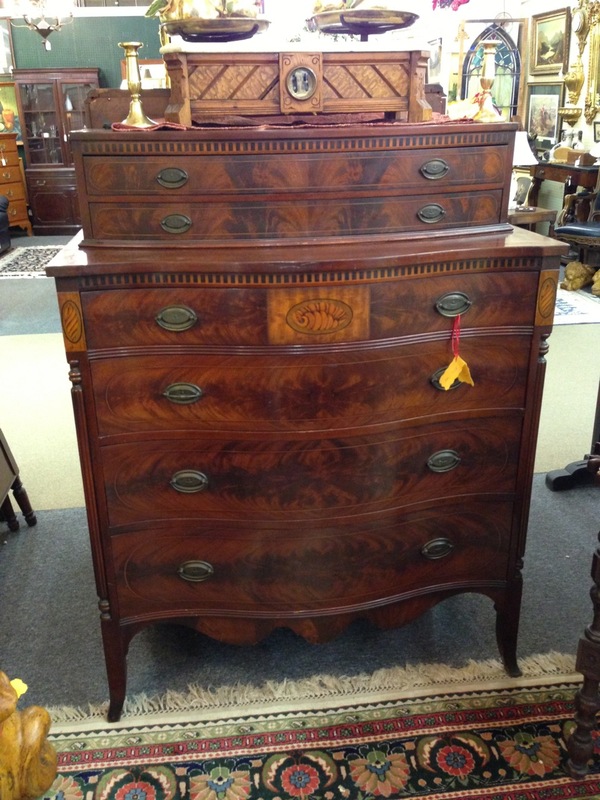 He used to be one of the leading period furniture makers in southeast Pennsylvania but he moved. He is late of the Acanthus Workshop and now a founding partner of 360 Woodworking. A few years back I signed up for the inlaid stand class with Freddy Roman at the Acanthus Workshop. Problem was that I was the only person that signed up. Mr. Bender and I discussed it and decided not to make Mr. Roman to come down to teach a class for one person. Our compromise was for me to come north and spend a week hanging out and working on skills related to making the inlaid stand. In other words, he would be my friend for a week if I paid him. Since this is the arrangement I have with many other “friends”, I readily agreed. This was not true when I was younger. Back then, my parents paid. One day, Mr. Bender had some real work to do and left me alone in the back room with some veneers to lay up a cross banded top as if I were making the inlaid stand. I discovered I enjoyed working with veneer and cross banding. It’s like working a puzzle only with sharp tools and tape. Come forward to present day and I suddenly was presented with the opportunity to do some more cross banding. 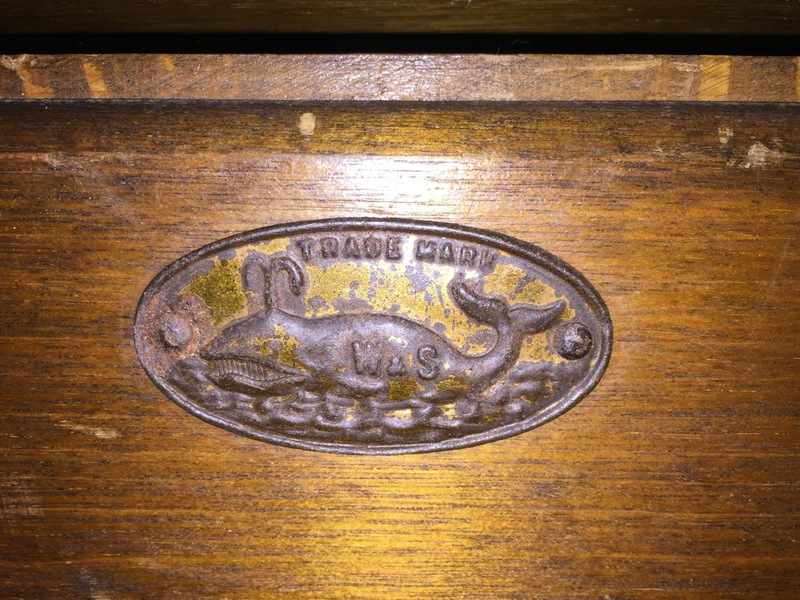 The drawer front from the curved front wall cabinet (see yesterday’s post) needs to be 1 3/4″ thick. 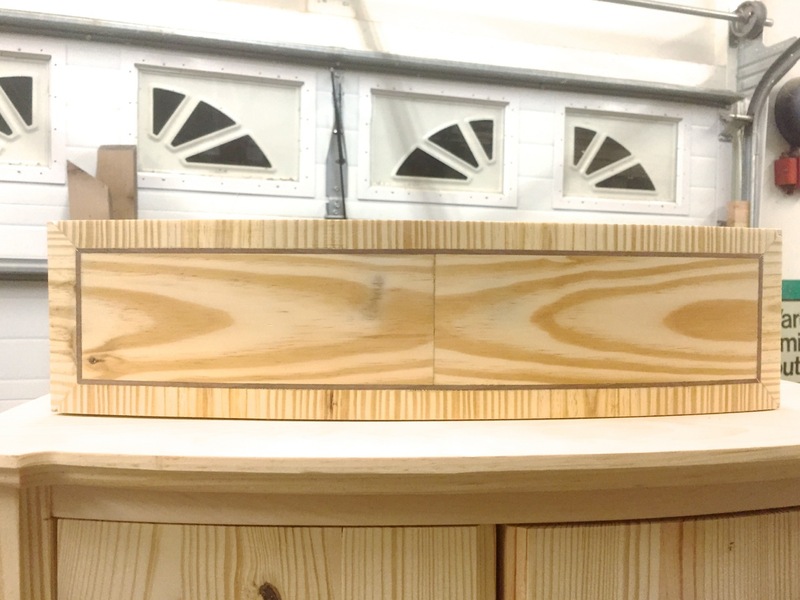 Since a 2 by 12 is only 1 1/2″ thick, I glued up my drawer front from two 7/8″ blanks. 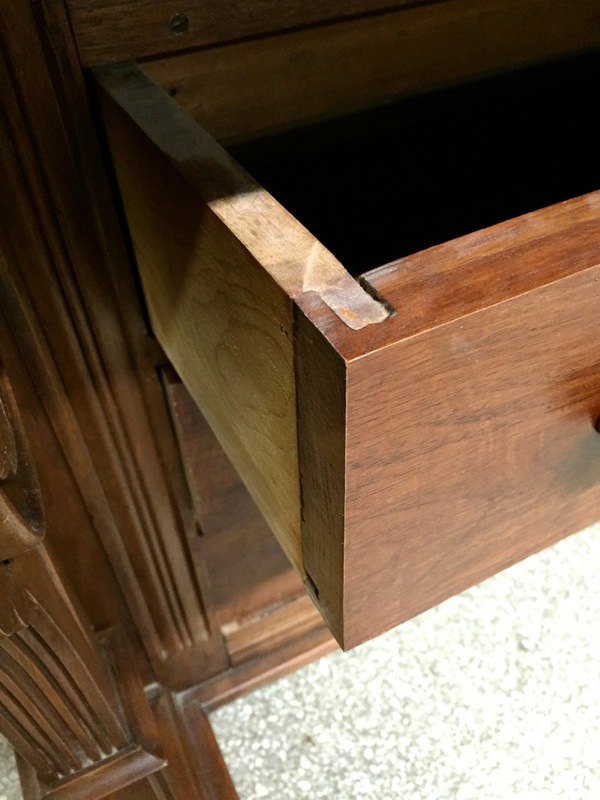 When the curve was sawn into the drawer front, the curve ended up crossing the glue line exposing both halves, the glue line and the differences between the halves in grain and color. It looked odd. It occurred to me that this would be a good place to use some veneer. Just glue some veneer and cover my lack of forethought. 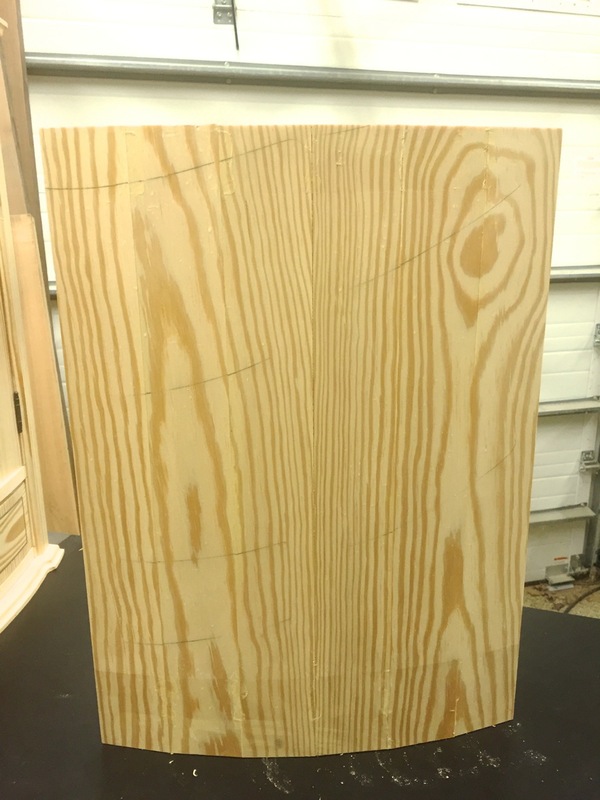 My next thought was that if cutting and veneering southern yellow pine was absurd, cross banding with southern yellow pine would be even more absurd. Sometimes absurd appeals to me. 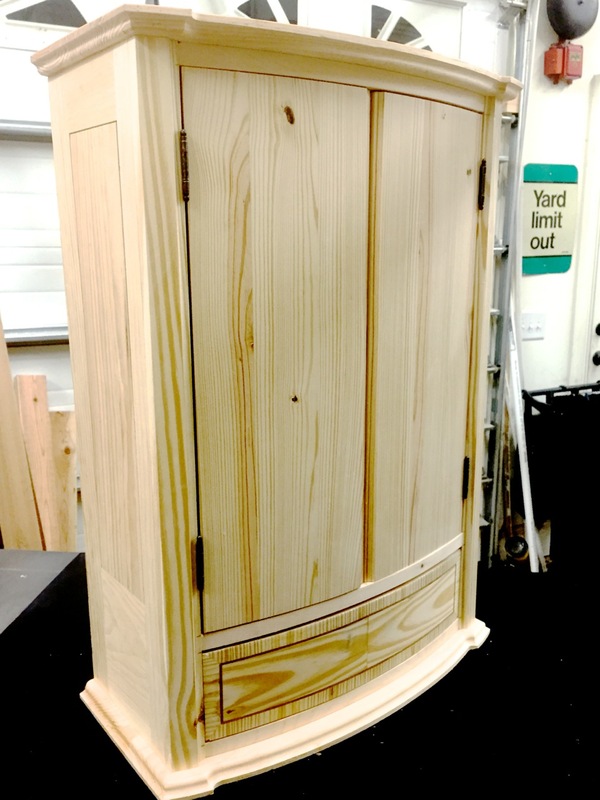 Southern yellow pine is not the easiest wood to work with but it is possible. 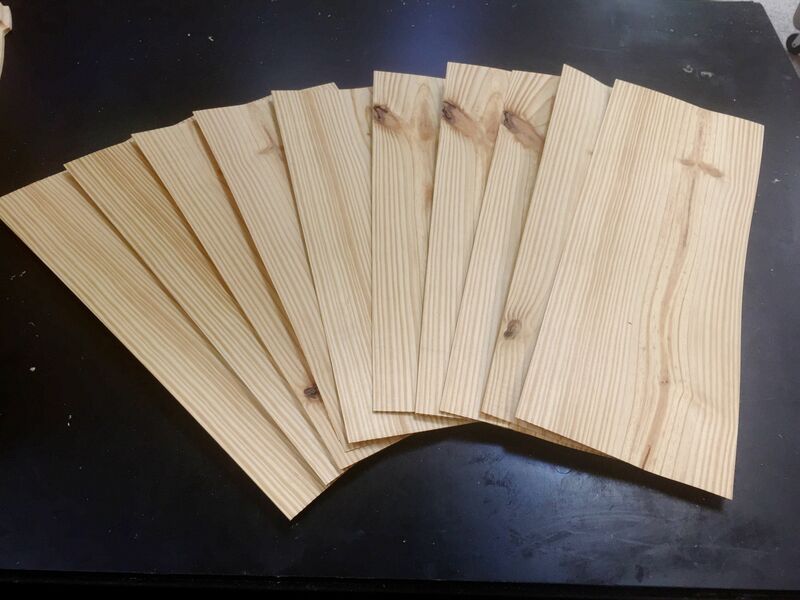 Light wood is extremely soft and the darker wood is harder and a bit on the brittle side. Challenging but if we were looking for easy we would all be (insert your least favorite activity here). The dark areas are burn through. Instead of vacuum bagging as I was taught, I was in a hurry and clamped it, badly. I used the cut offs to clamp the outer two-thirds and applied insufficient pressure to the center allowing the hot hide glue to accumulate in the center and bubble up unevenly. Sanding revealed my lack of technique as the congealing glue came oozing through the thinned wood. Like many other things I’ve done, it started as a woodworker’s inside joke and turned out better than I thought. Then I get annoyed that I didn’t do it better although I didn’t set out to do it well. 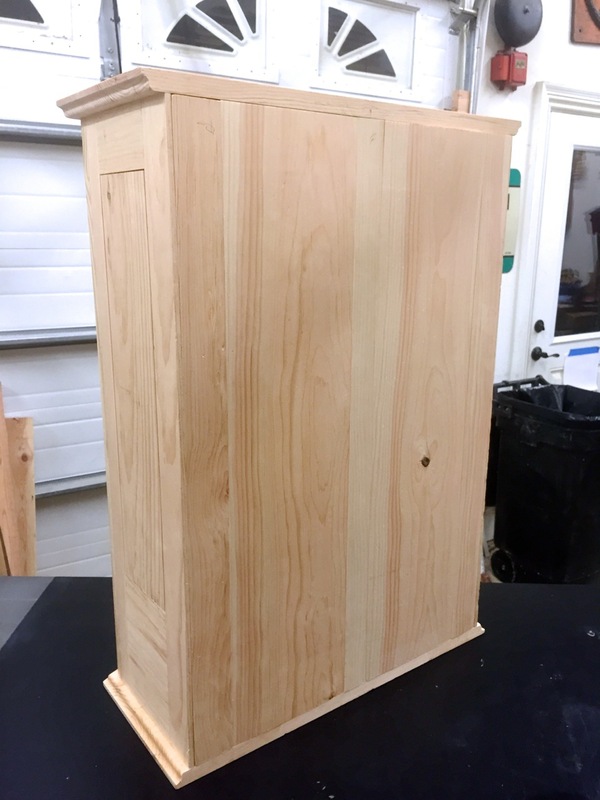 Some woodworking pundit recently wrote about always doing your best work. On some level he was right. I’m still not going to build my jigs and templates from Baltic birch. Or put a finish on them. 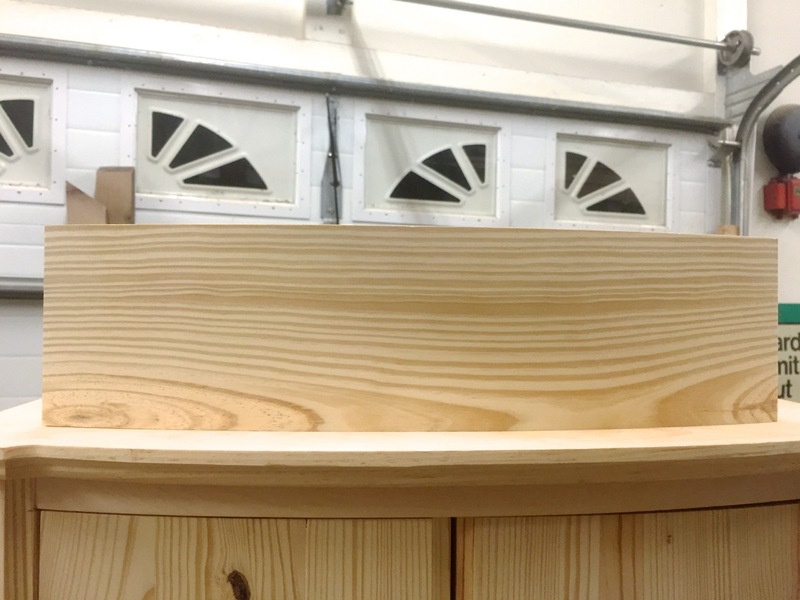 I made another drawer front this time leaving the front section as thick as possible and only adding enough wood to the back to make up the 1 3/4″ thickness. It turned out much better. And I made enough pine veneer to open my own IKEA. Using a 14″ Rikon bandsaw with a 3/8″, 4 TPI blade set up as per Michael Fortune. No measurable drift. 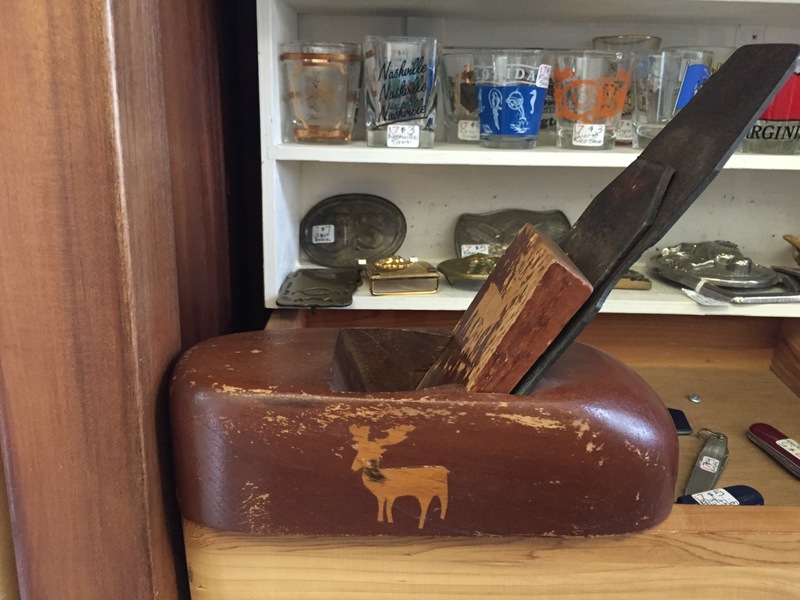 Many of us will recognize this as the opening of every episode of The Woodsmith Shop, the TV outlet of Woodsmith magazine. Don is Donald B. Peschke, publisher and founder of August Home Publishing Company. The show is now in its eighth season. I don’t love everything about the show, at times is seems like a Kreg infomercial, but they do seem to have an arc, as it were. 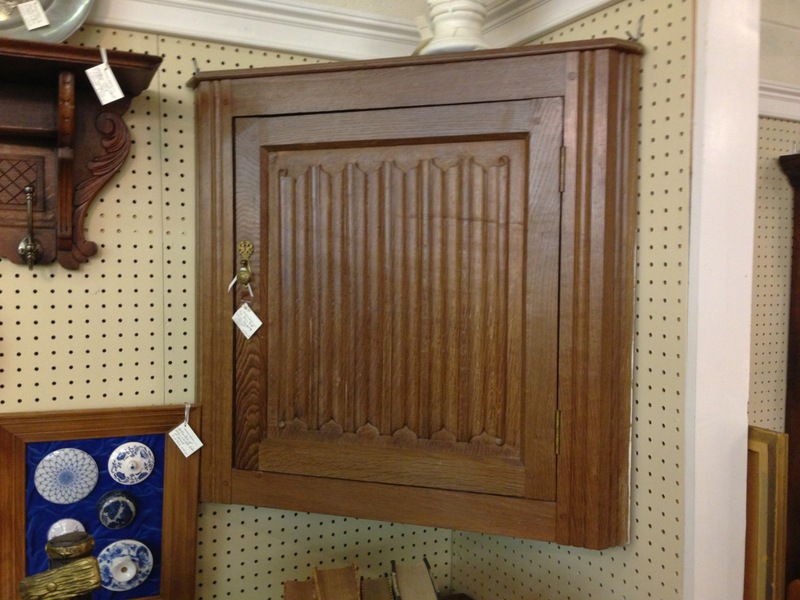 The first few seasons were basic information about setting up and outfitting a shop. Lots of jigs and fixtures and skill building. It wasn’t until the third season that they built their first piece of furniture. I am more likely to build one of their projects than Tommy Mac’s or Scott Phillips’. I don’t agree with all their aesthetic elements but knobs are easy to change. A few months back, Woodsmith returned to the local public television station. Woodworking shows come and go and then come back. I don’t understand. The only consistent show has been The Woodwright’s Shop and that mostly because they produce it. 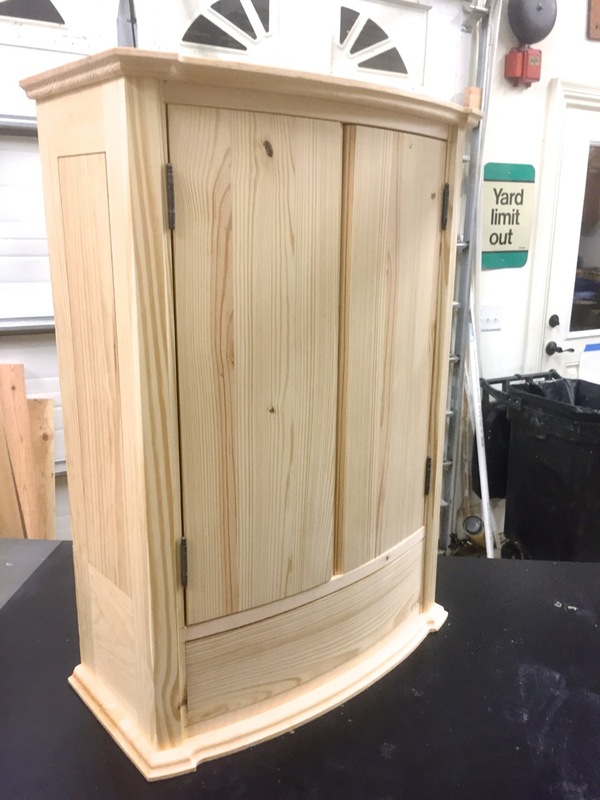 Season 8, episode 3, the Curved Front Wall Cabinet, looked interesting for the Monday night woodworking group. I have been trying to steer the group back to the furniture track. As with any group, there are different interests and skill levels. Some prefer shop jigs and accessories. Some are fixated with sharpening. Others, like me, are more interested in furniture. Some are just happy to be out of the house and doing anything related to woodworking. 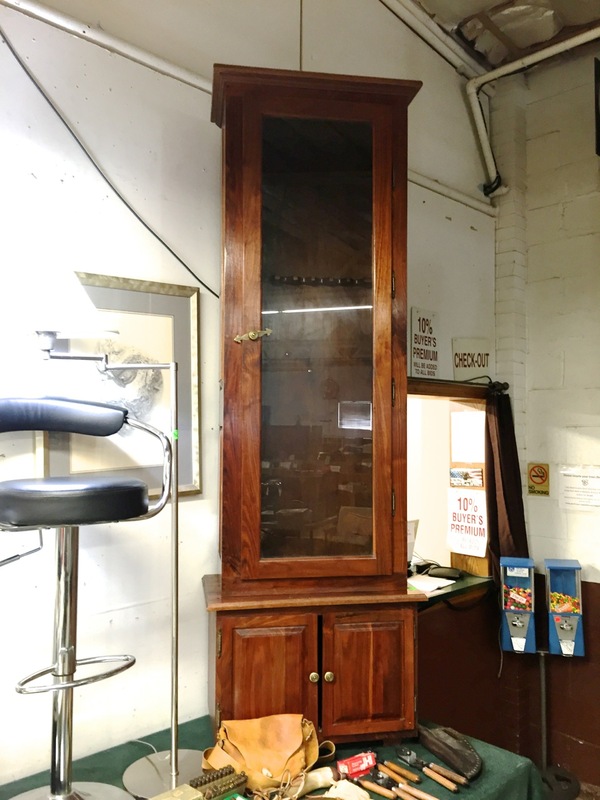 The Curved Front Wall Cabinet in all its glory. You might notice it’s in pine, southern yellow and white pine. All construction grade and none of the fancy “white wood”. It comes down to cost. If I am going to build several of these, I am going to use an affordable wood. The doors are 7/8″ and the front rails are 1 1/16″ so I needed to use some 2 by lumber. 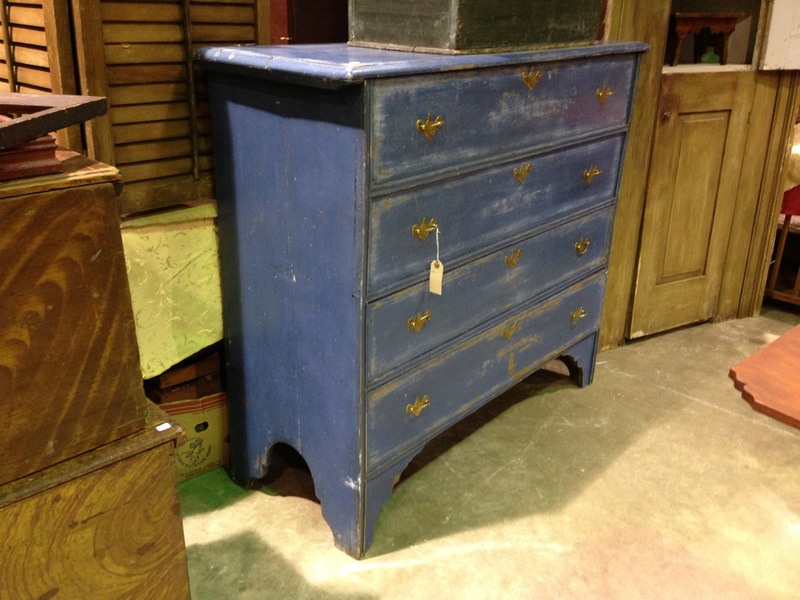 Milk paint can cover a multitude of sins. Construction is slightly challenging. Nothing esoteric or extreme. 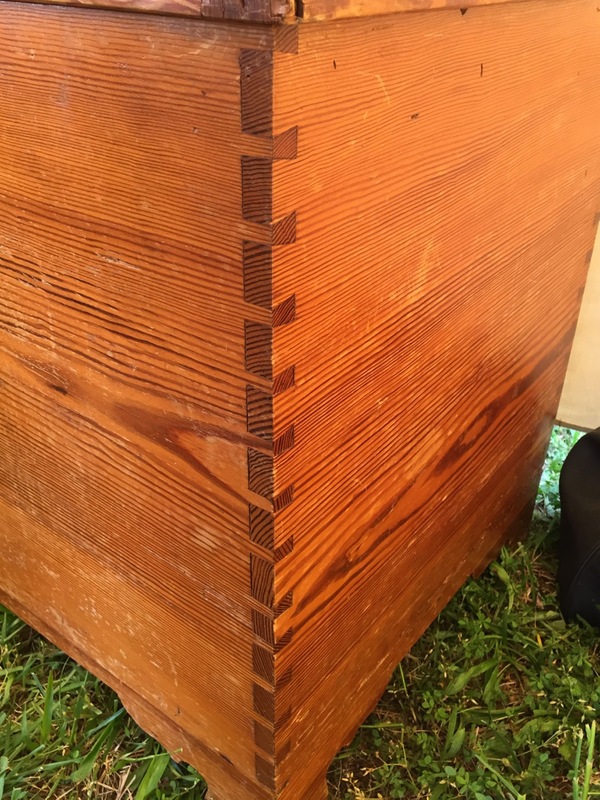 Just basic fussy joinery. The doors are coopered, made from staves like barrels. To make things a bit easier, you glue up both doors at the same time on the same form. A wider panel is far easier to handle and get a uniform curve. One issue I had with Don’s methods is fairing the doors. 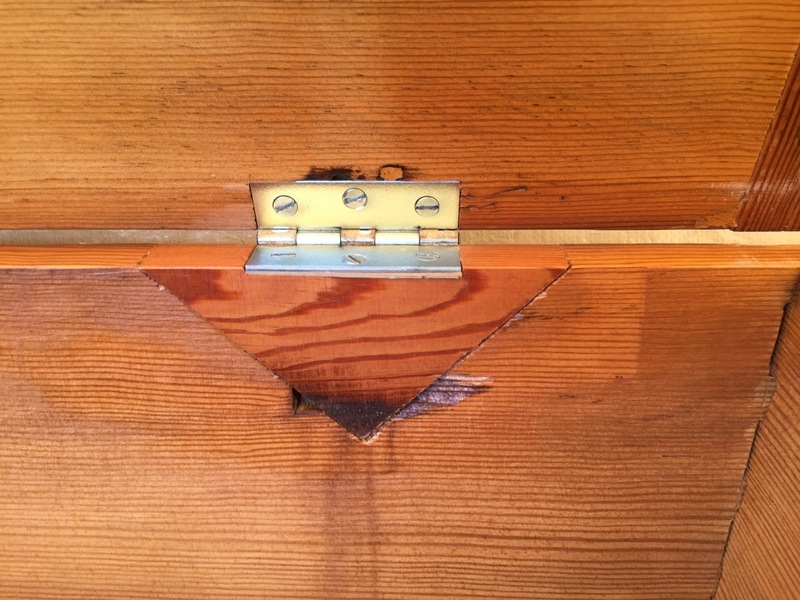 Being glued up from six, three-inch boards, the front surface of the doors is not smooth. Stylistically a faceted door could work but Don wants you to smooth it. 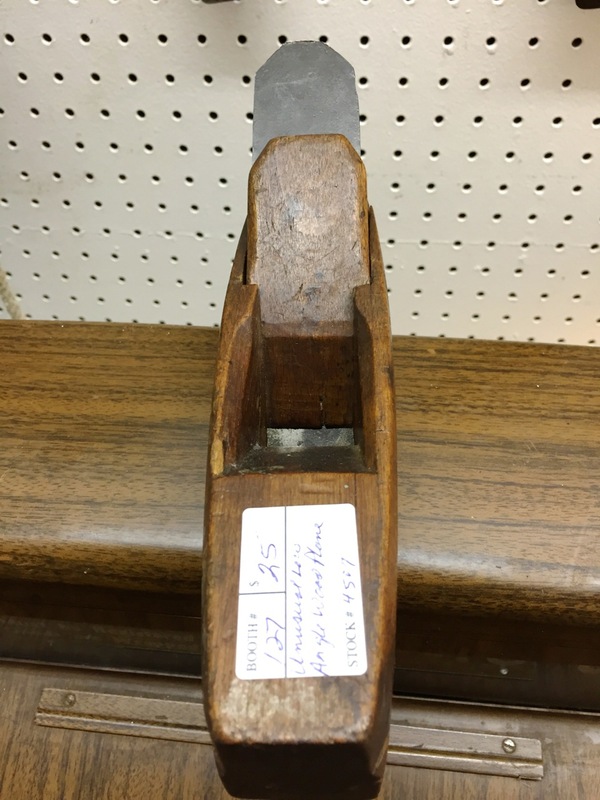 Don uses a block plane. I used my trusty Stanley #7 jointer plane. Could it be that Don doesn’t believe that we all have #7 jointer planes? 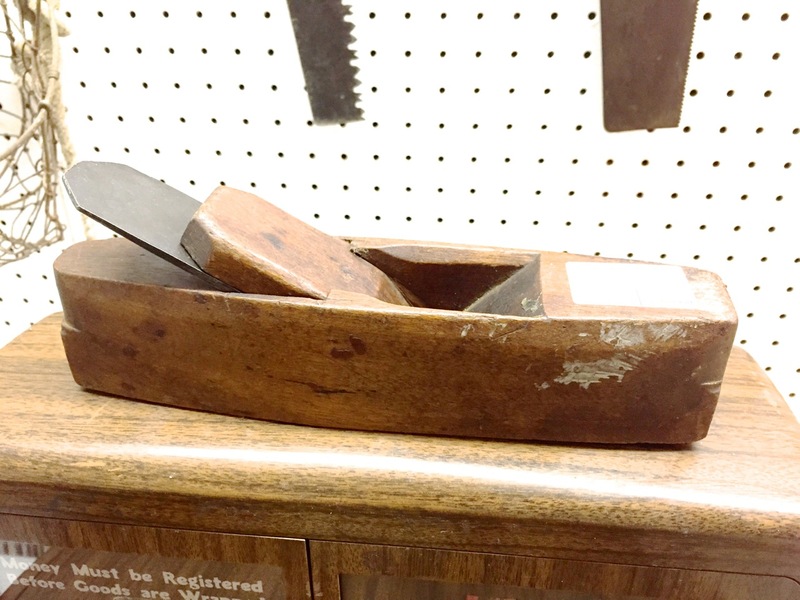 I could have used my new Lie-Nielsen #8 jointer plane but I hadn’t bought it yet. The grain more nearly matches. 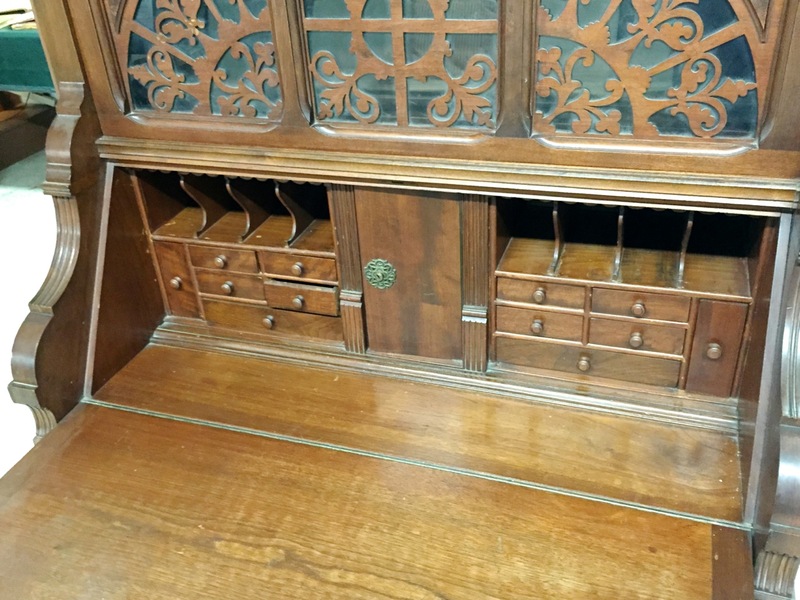 Why is this drawer different? but unfolds into a bed. The sign of the wale. 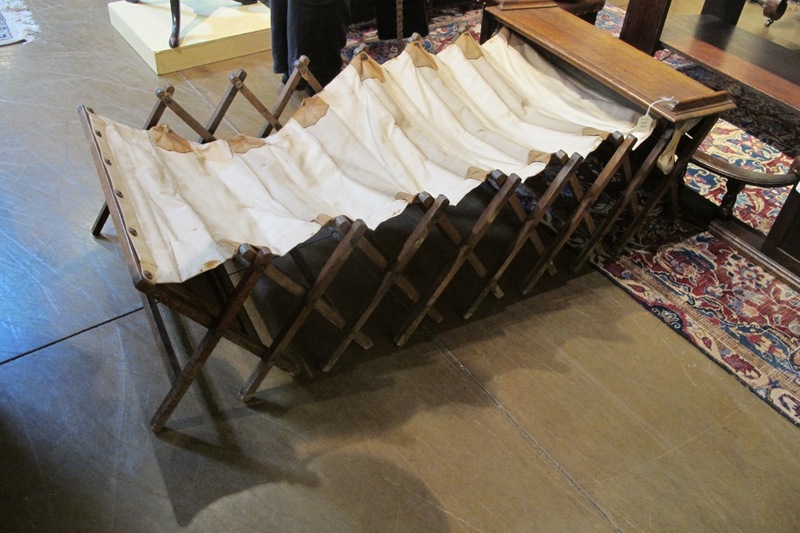 “Cabinetta” campaign bed by maker W & S Wales. Used by high-ranking British officers in WWI and the Boer War. Solid mahogany bench and frame easily converts to canvas cot and includes cotton batting sleeping pad. 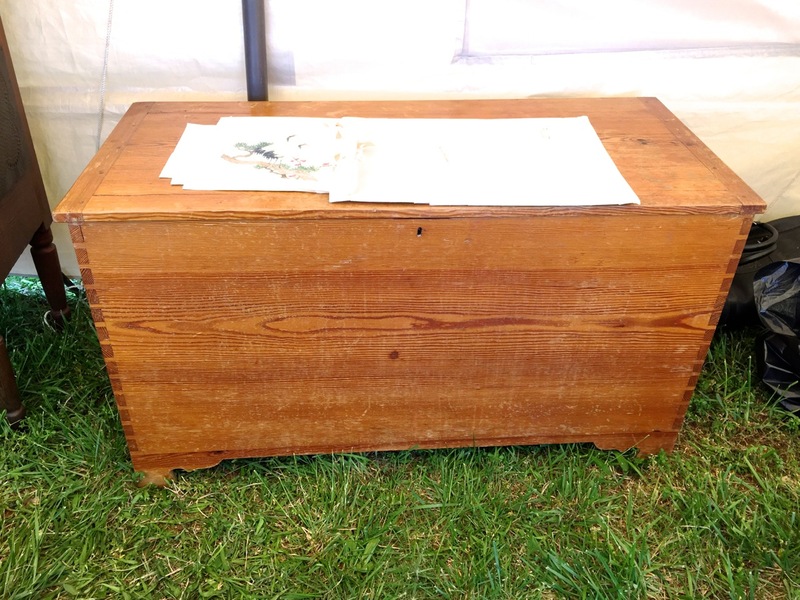 Sturdy and easily transportable, has canvas carrying handles & folds down to form a small seat or table. Yet another view. Looks hand made. 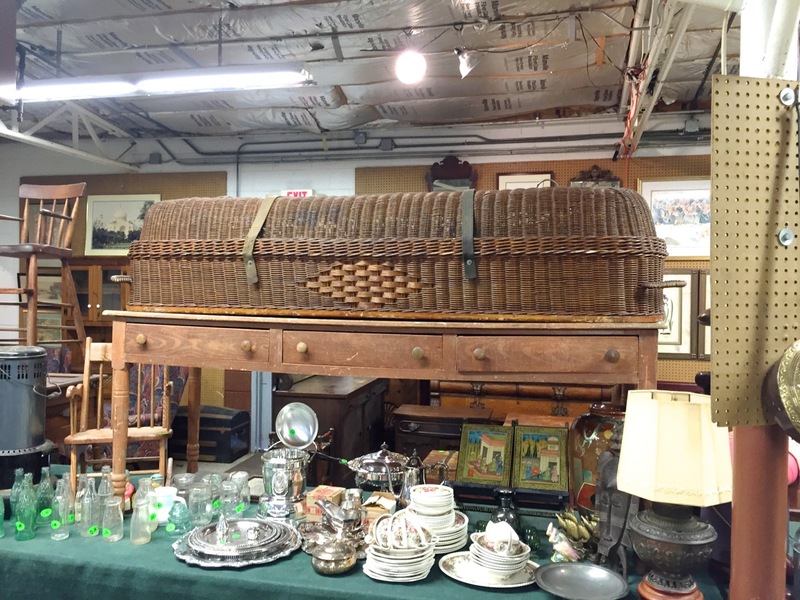 The cross-town auction house had stuff, too. This one confused me a bit. 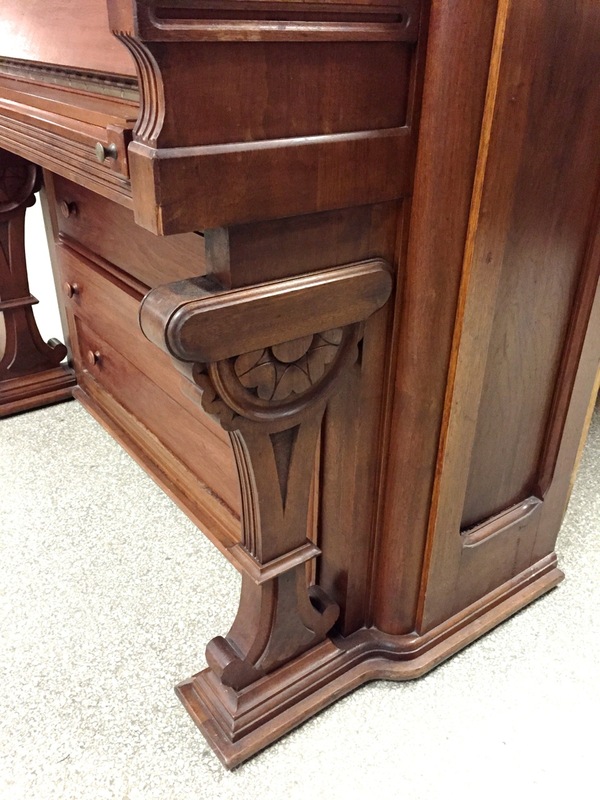 Is it a piano converted into a desk or a slant front desk built to look like an Eastlake, upright piano? 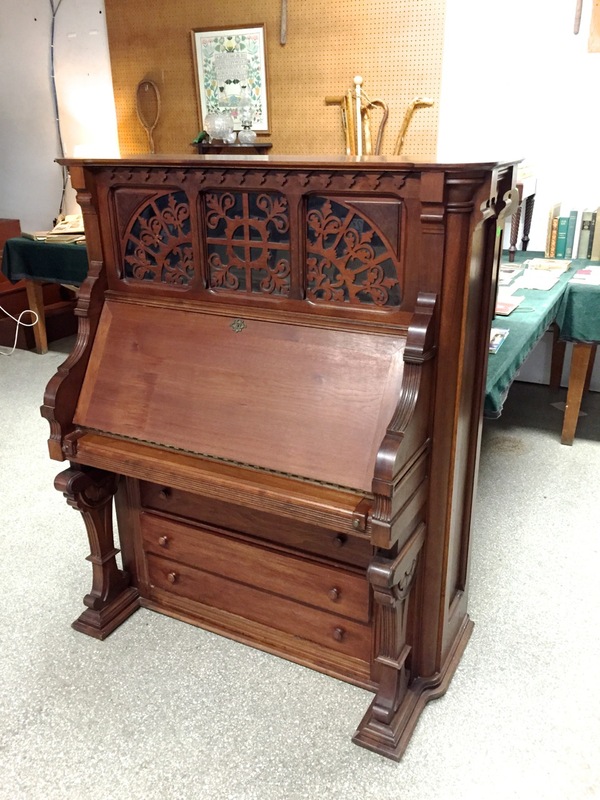 Piano to desk or purpose built piano desk? Pianos don’t generally have one of these. Streaming audio player without local storage. 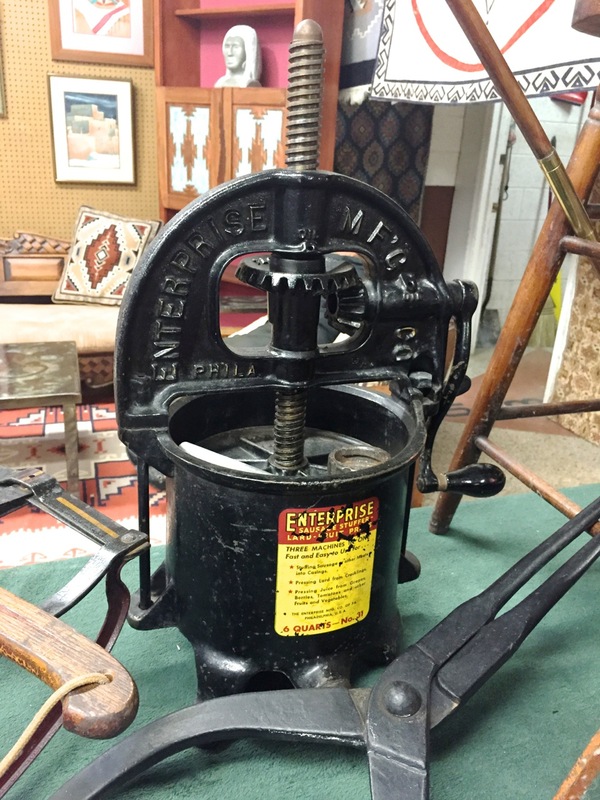 The Enterprise Sausage-Stuffer – Lard – Fruit Press. by the Enterprise Mfg. Co. of Philadelphia, PA, USA. It was a multiuse device before Ron Popeil or Ronco. Pressing Juice from Grapes, Berries, Tomatoes and other Fruits and Vegetables. 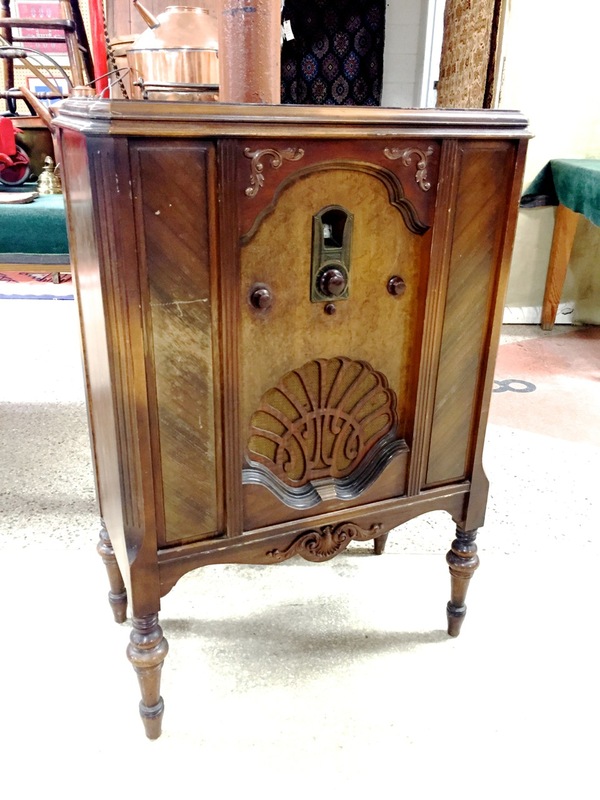 To see more pictures of these items and the rest of the auctions, click HERE. 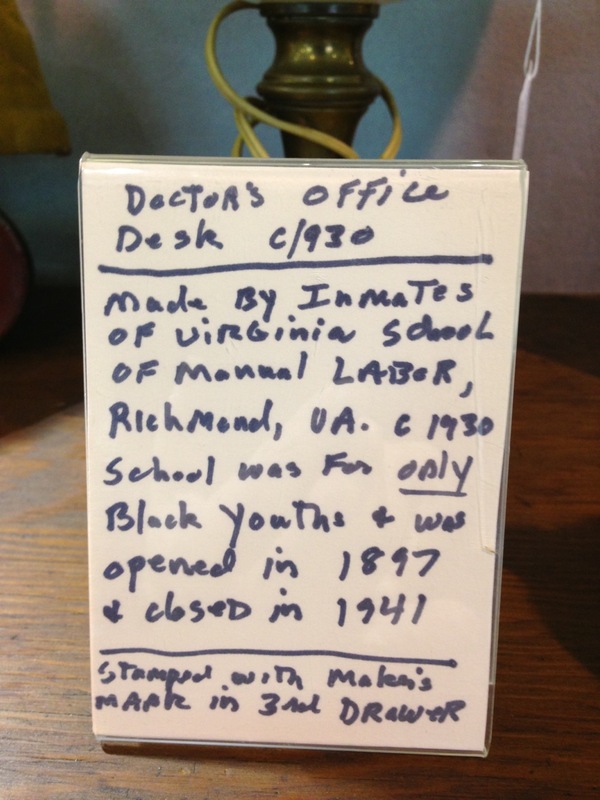 A good excuse to get off 95 and stretch your legs is an antiques mall just north of Richmond, VA. The Virginia Museum of Fine Arts is a better reason but it’s way across town and you have to park. This mall is right close to I-64, I-195 and I-95. Easy off and easy on, as they say. 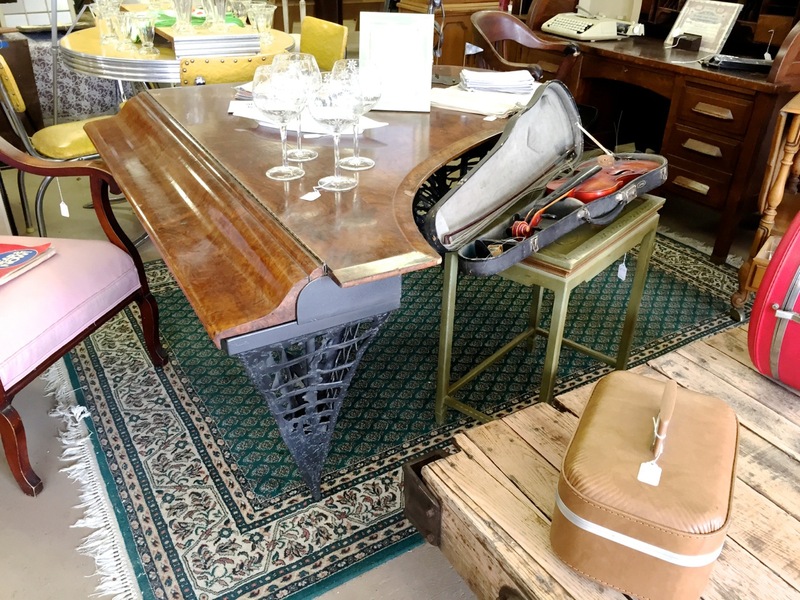 This table almost has too much going on. Splay legs, stringing, some banding and odd little feet. Just like grandma used to own. Not yer typical inside door panel. Can it be made any thinner? Not quite 45° but close. To see all 130+ pictures, click HERE. 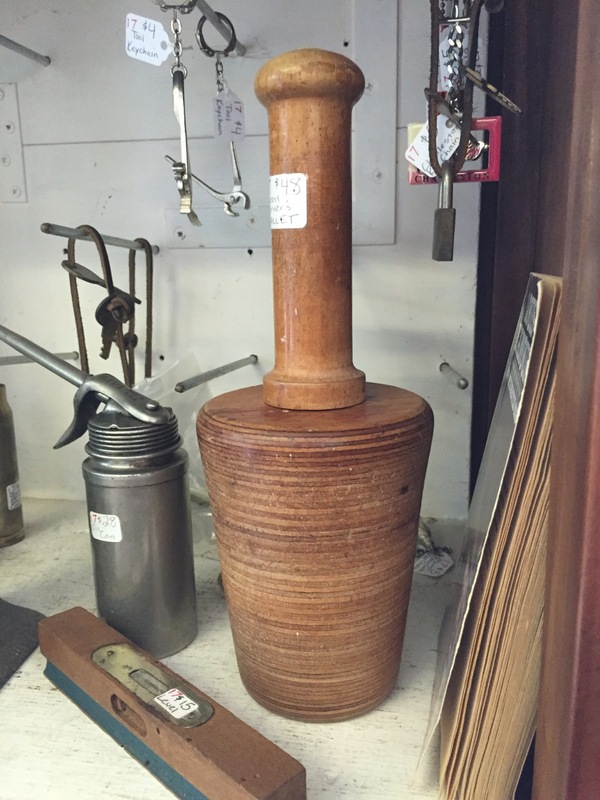 There are often things I see at auctions and shops that are interesting yet are not easily classified. 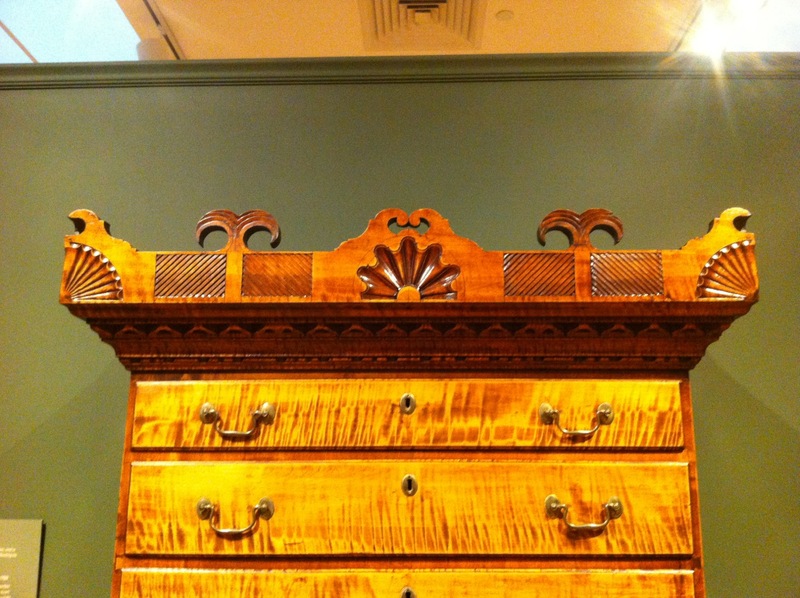 Objects that don’t really fit into categories of furniture that I write about. They are unique items that need to be shared. 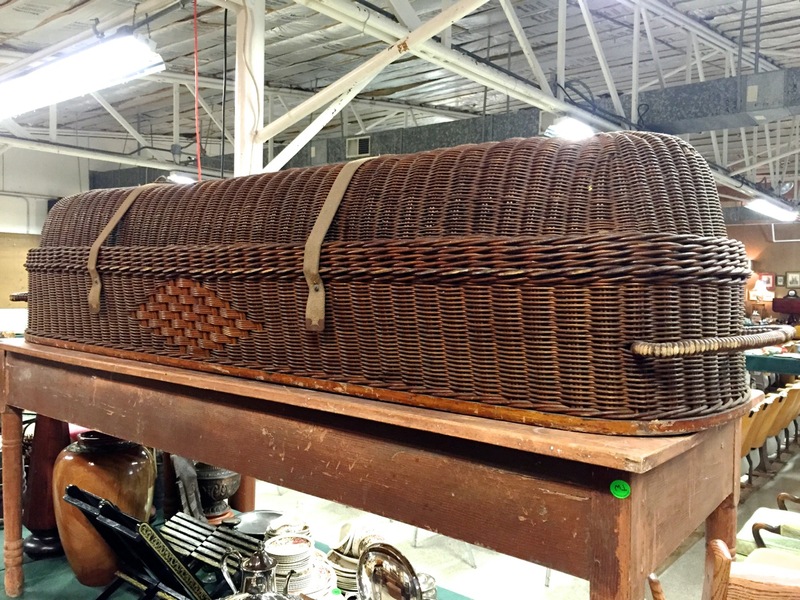 Used in earlier times to transport the recently deceased to wherever they are transported to. Back in the days before gurneys and body bags. I think it’s perfect for the casual, springtime funeral. 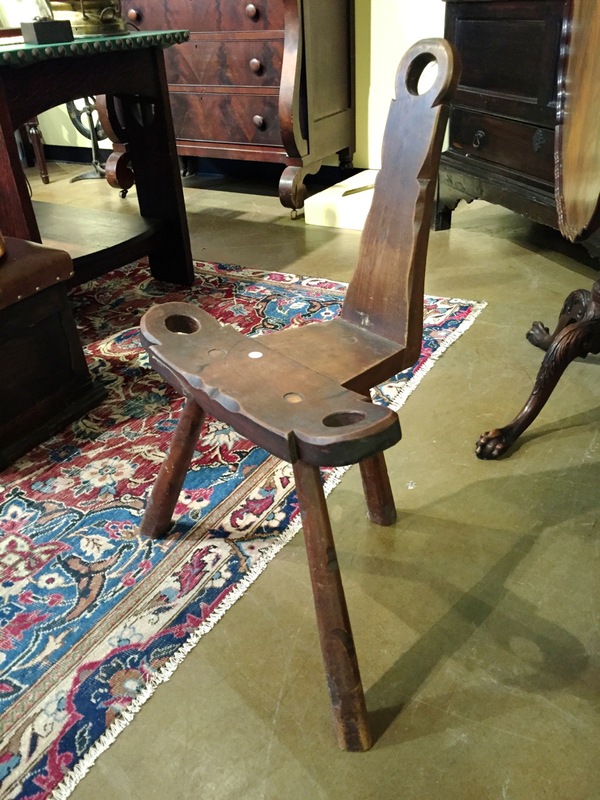 A gout rocker, only different. What makes it unusual? It’s empty. Lots of second amendment enthusiasts in North Carolina. A low angle coffin smoother. 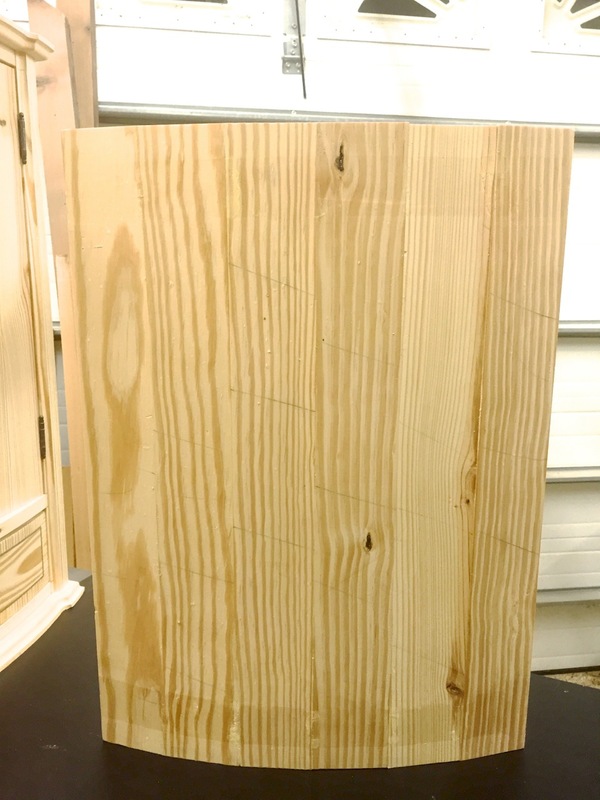 A narrow, low angle coffin smoother. 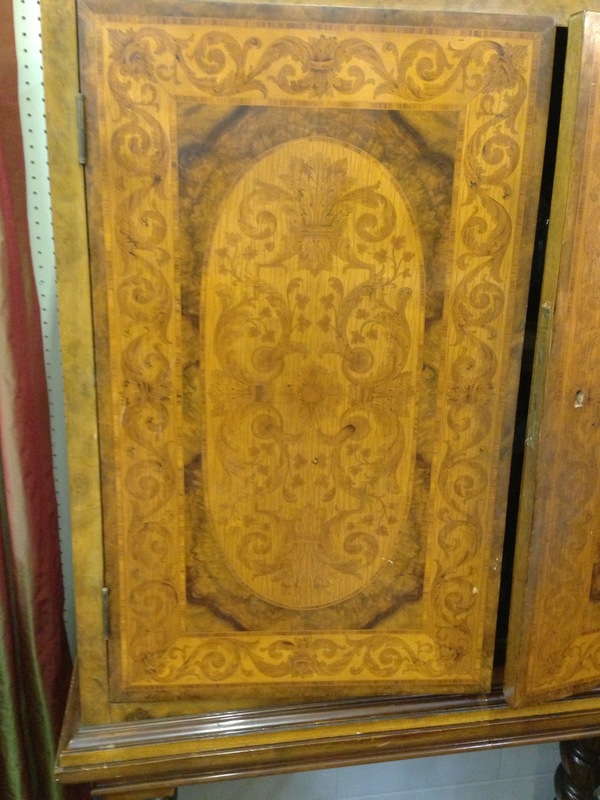 I found this decorated coffin smoother. 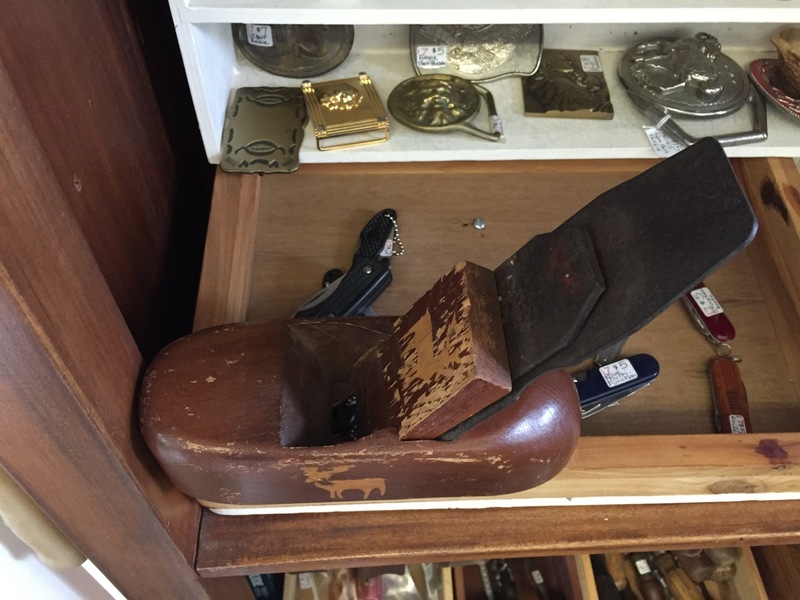 They called it a coffin smoother but I thought it looked more like a Mary Jane, as in the style of women’s shoe. More rounded that most coffins. Taper is not what I expected. 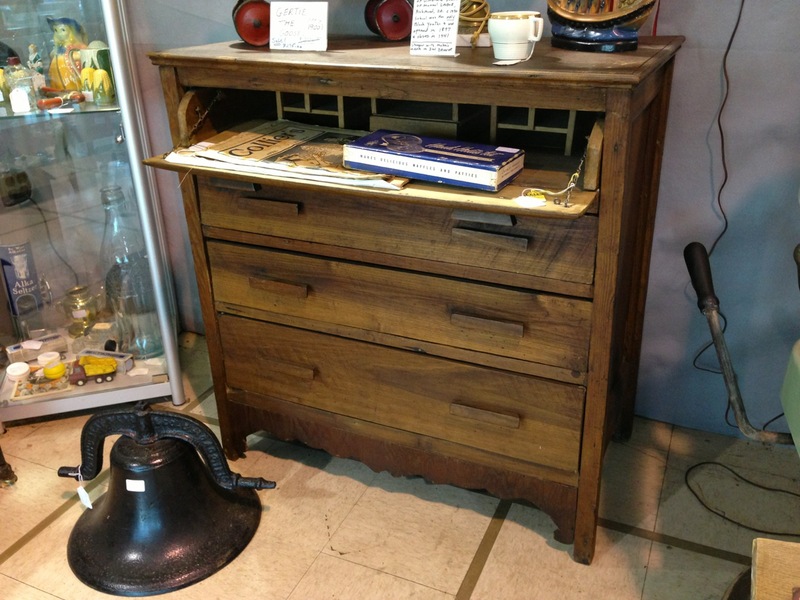 Way back in February of 2013, I indulged in an 90 mile pursuit of primitive furniture and antiques. It wasn’t necessarily my plan, it’s just the way it worked out. 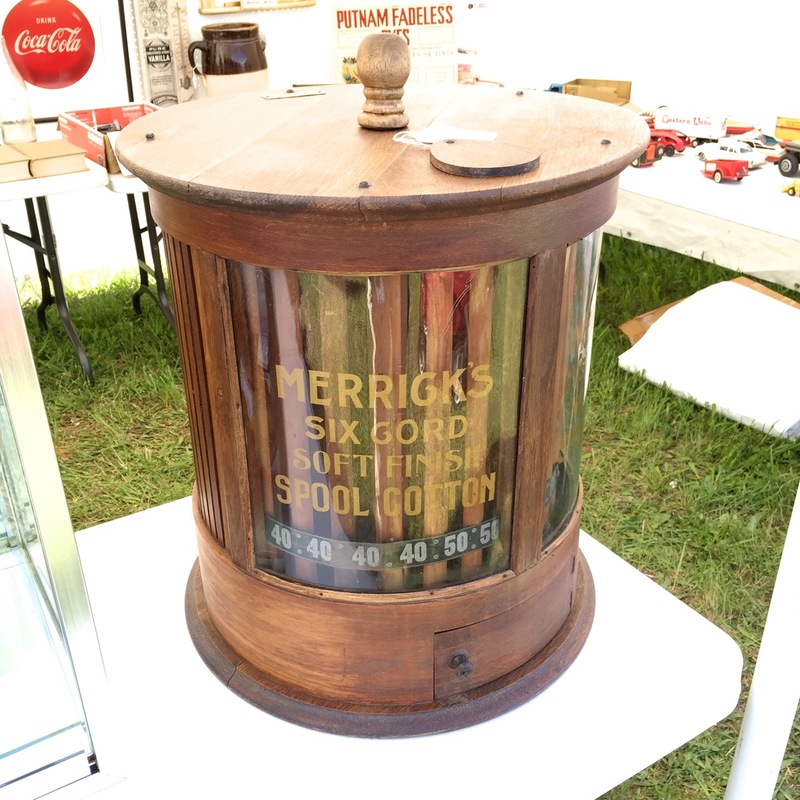 It all started when I became aware of an annual primitive antiques show in Fishersville, VA. The idea intrigued me. My wife was still studying at the Culinary Institute in California , so I was free for the weekend. I needed a plan maximize my viewing pleasure. What I came up with was heading north on Friday and taking the Behind the Scenes Tour at Thomas Jefferson’s Monticello. This tour takes you to some areas of the house that are not on the regular tour. Mostly the second floor. I have toured the main level several times but had never made it upstairs. It was interesting but I don’t need to do it again for a while. I then went a bit further north and visited Montpelier, James Madison’s plantation house near Orange, Virginia. In the early 20th century, a branch of the duPont family acquire the house and greatly expanded it. In 1983, the last private owner of Montpelier, Marion duPont Scott, bequeathed the estate to the National Trust for Historic Preservation. The Trust spent several years restoring the house to be as it was when occupied by the Madisons. My wife and I have visited it several times to check out the restoration. 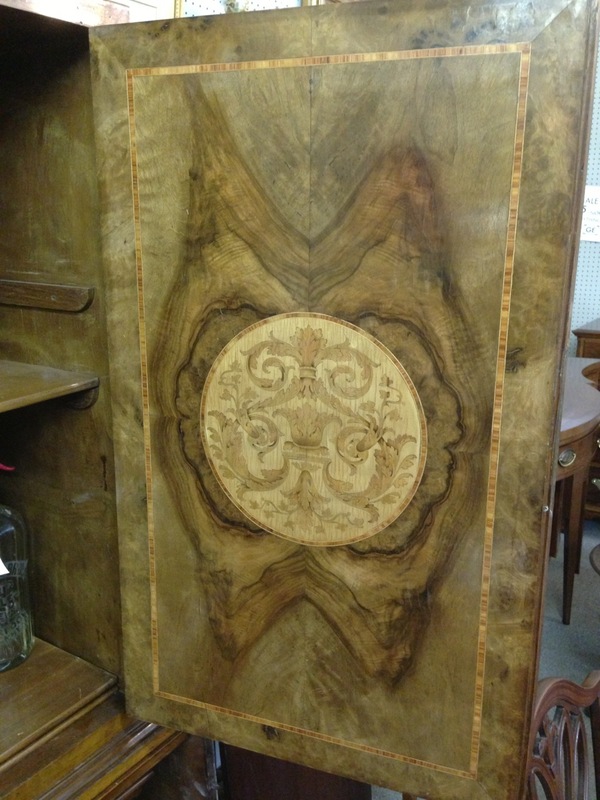 The last time we were there, the restoration was complete and they were vetting the returning furniture. 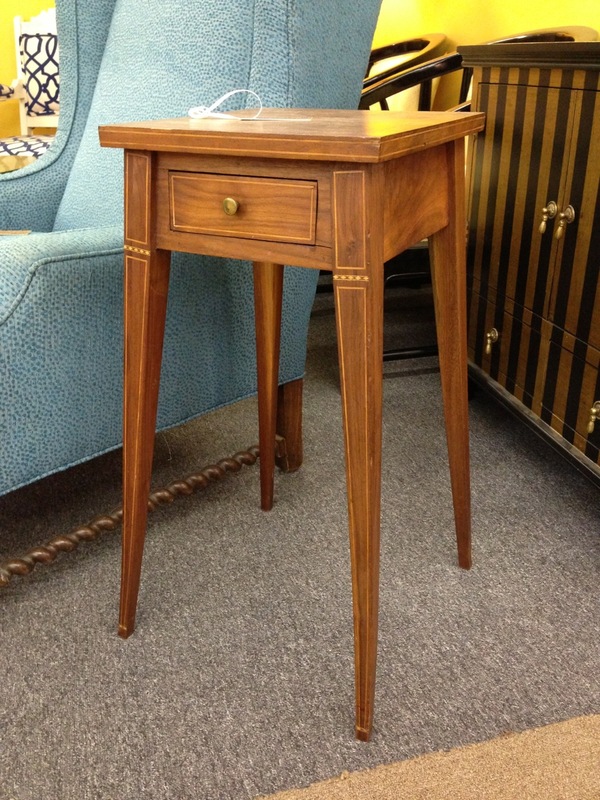 A table with four, quarter round legs. 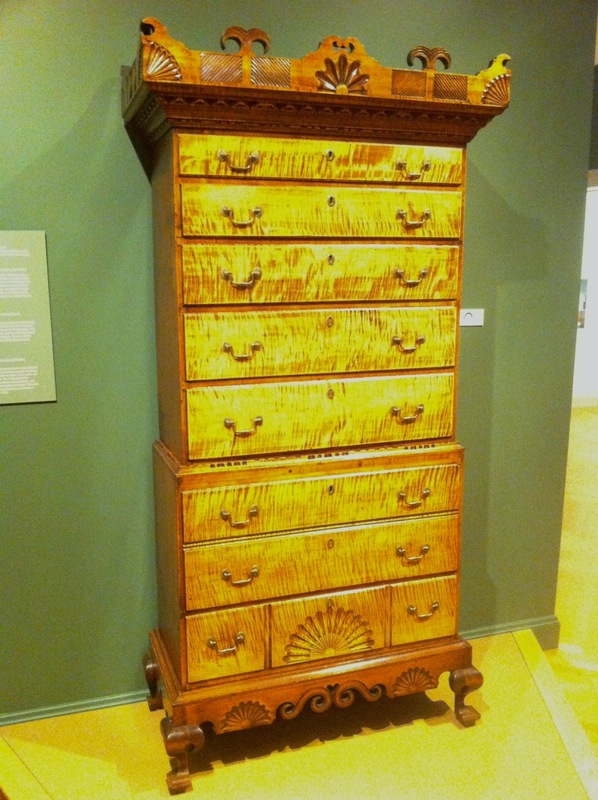 When I see a piece like this one, I think that it might have been built by a carpenter and not a furniture maker. 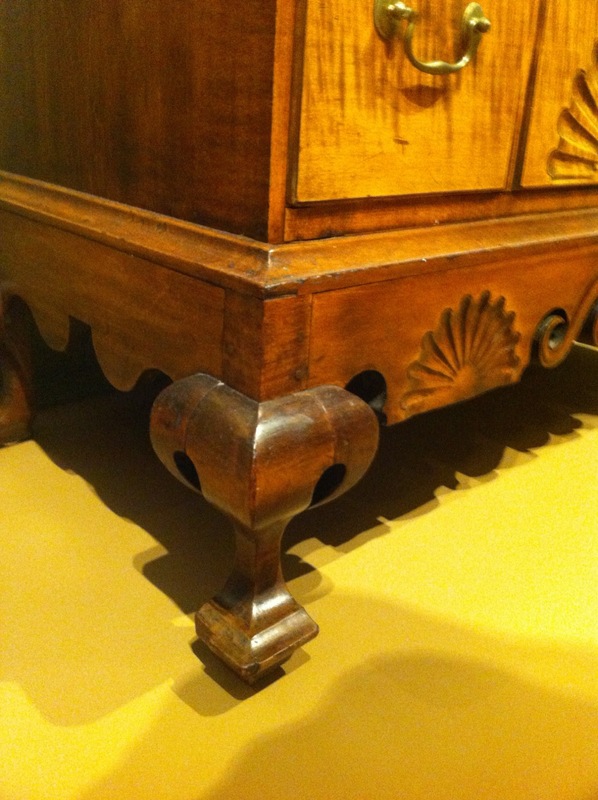 Construction is closer to a boarded chest with the legs being continuations of the sides and not things attached to a carcass. After absorbing everything I could from the show, I started back home driving south along Interstate 81. 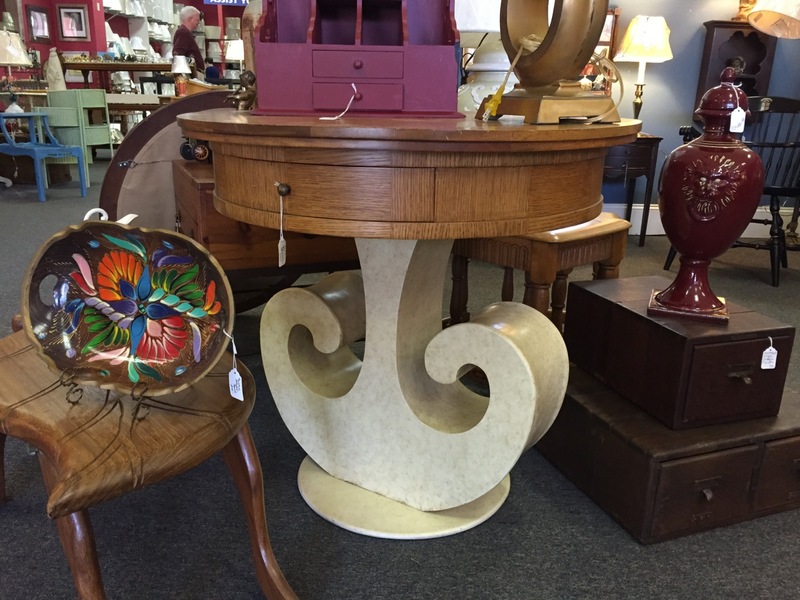 Along the route, I hit every antiques shop I could find within a few miles of the Interstate. At 5:00 PM, I visited one last shop in Roanoke. Along the way, mostly primitives. 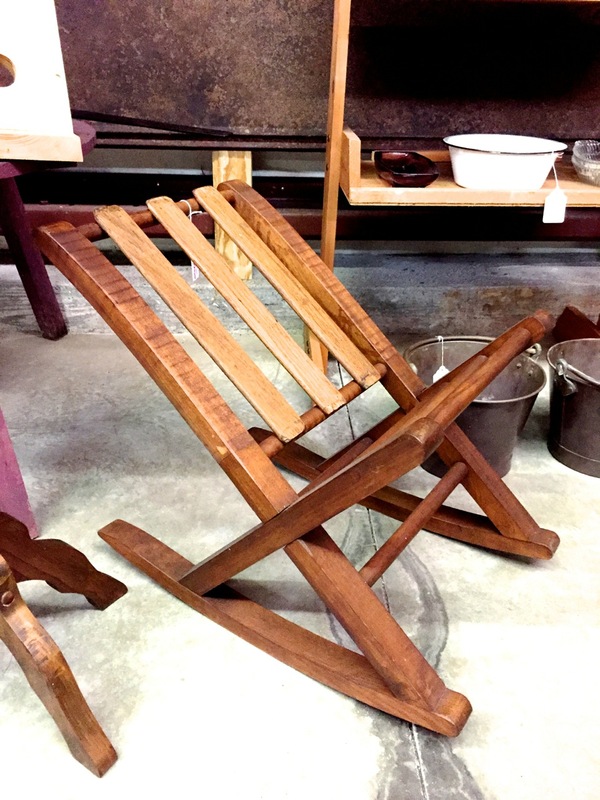 After nine hours of antiquing, I was very tired of ’50s rock. Every shop. No classical. No show tunes. Fortunately, no Elvis either. When I lived in Pennsylvania, there was a large antiques mall that played Elvis all day on Thursday. I never went there on Thursdays. And this desk with an interesting story: A long and interesting day. Still two and a half hours to home. To see all 131 picture in this set, click HERE. Back in December, I fled north to the Boston area to avoid a weekend beach rental with wife and friends. I don’t love the beach and this would have been the sixth trip to this Emerald Island rental house in the past seven years. Saturday, I drove up to Manchester, NH to visit the Currier Museum of Art. 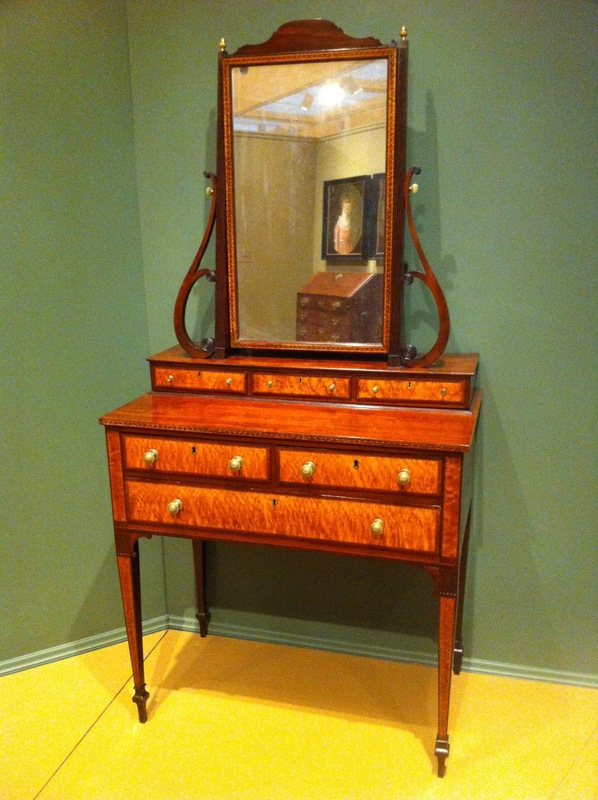 I wrote about part of this visit in Come to New Hampshire for the Contemporary Furniture? 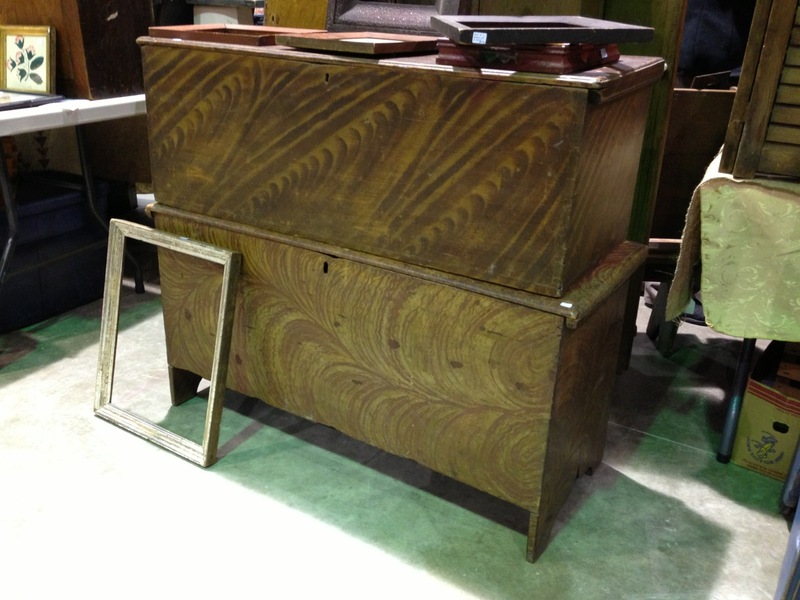 Not all old furniture is dark brown. It’s maple, another not-dark-brown wood. Unusual molding around the lower chest. 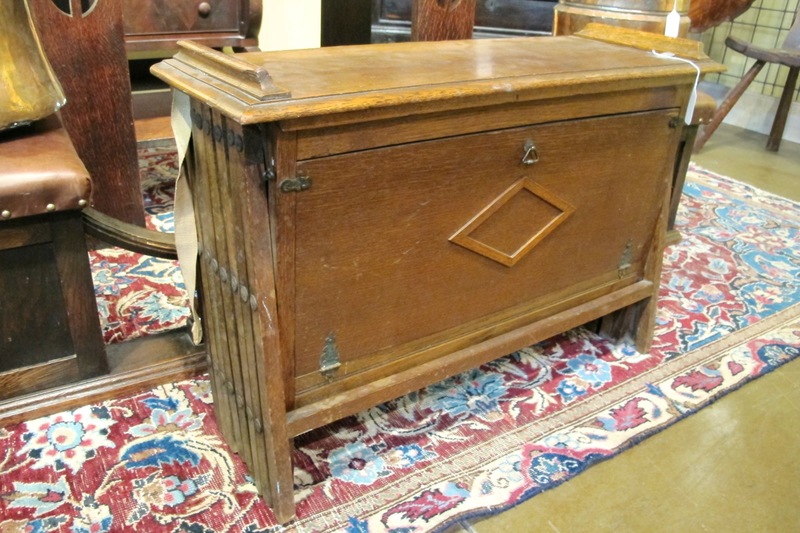 This chest was described as “one of the most original and inventive pieces of American regional furniture from the late 1700s”. I can’t argue with that. I’ve not seen anything like it. 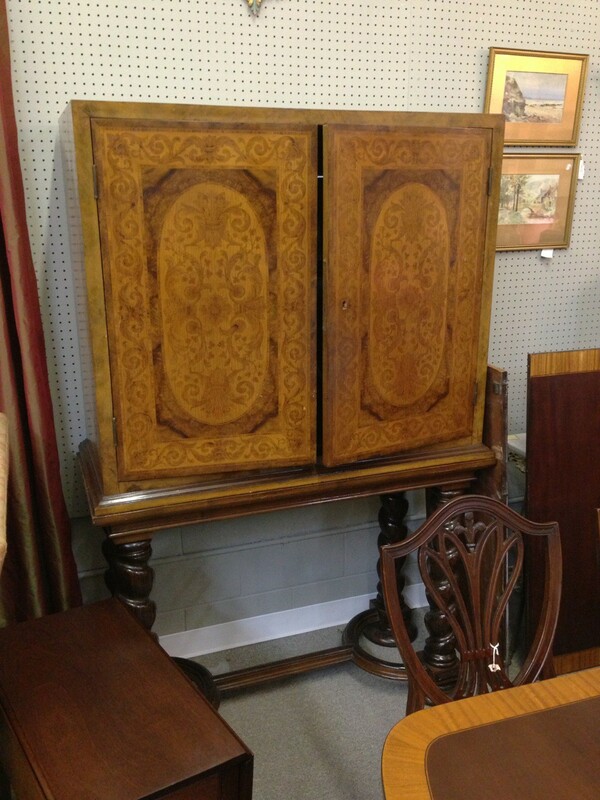 If you need to purge yourself of the horror of the odd table, you can check out the Currier’s collection HERE. “Curious” as Spock Woiuld Say. Interesting that the week in which I had no new posts, the number of followers went up. Views and visitors were down but one would expect that. When I issue a new blog post, the number of views and visitors goes up. This makes sense. Occasionally, the follower count goes down. I try not to think about it. I am not all that concerned about numbers, however. With the new grant, I am good for at least another three years. By then I should really be out of things to write about. Some argue that happened two years ago but I choose to ignore them. The blog was down for a few days while we were on shoring production. As most of you know, since the beginning of the blog it has been written and edited by the staff in Bangalore. I found that most Indian editors had a better understanding of grammar and spelling that I ever hope to have. With the new grant, I had the money to bring all this back to the US. OK, most of the work is done in the break room at the Hyundai factory in Marshall, Alabama. Hey, I’m trying. Now that the staff has been selected and trained, blogs should be coming more regularly. Whether of not that is a good thing is not for me to say. As a follow-up to yesterday’s blog, It’s Just Wrong…, I would like to thank all of you who have commented. There were many interesting origin myths and stories. What I was looking for, though, was an explanation of why it’s wrong. 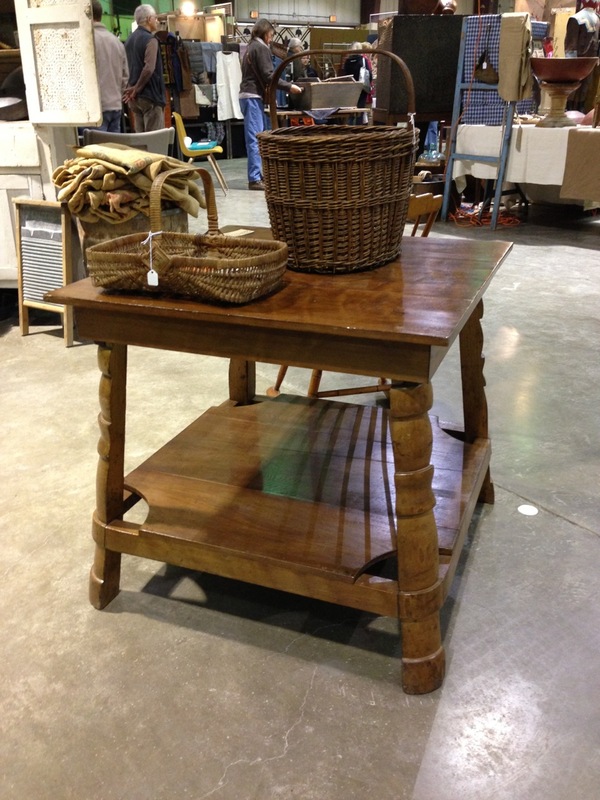 I want people who shop at Restoration Elm Barn to understand why this table is an un-good thing. Why some of us are amused and/or annoyed. Bad, bad table. Am I the only person that thinks anchor when viewed? I approved all comments but one. A reader called “Jeremy” seems to have submitted a no-comment comment. There was nothing there that I could find. Nothing to approve. He either forgot to include the comment or is a genius and is making the statement that there is no suitable comment to be made. Or, that needs to be made. Or, res ipsa loquitur, the thing speaks for itself. My readers are just that brilliant.